Let me begin by stating that I am not a Donald Trump supporter. I think he's a drooling idiot, I think the limited political platform that he's outlined thus far is extremely problematic, and I consider it a national embarrassment that he's doing so well. I say this not to upset or please anybody; I say it to make clear that this post is not some sort of reflexive defending of Donald Trump by a diehard supporter of his, nor is it an endorsement of his political platform. This post is motivated purely by my advocacy for honest and fair criticism, whether it's directed at friends or enemies. I found this recent smear to be so unfair and so absurd that I just had to weigh-in on it and try to inject some reason into the public sphere. Here is the allegedly problematic image. Perhaps calling HIllary the "most corrupt candidate ever" is a bit hyperbolic, but that's actually not what the scandal is about. 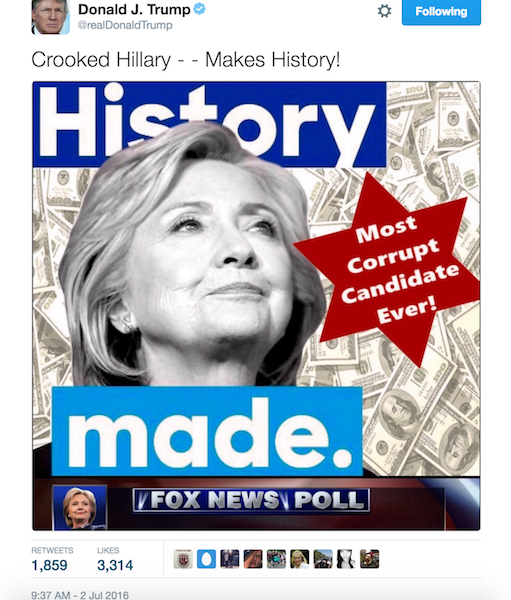 Believe it or not, Trump is being accused of anti-Semitism for re-Tweeting this image. Why? Because of the vaguely Star-of-David-like image that the text is superimposed onto. This is an incredible leap to make, and although I'm used to seeing cheap smear campaigns in politics, this is one of the most egregious and thoughtless examples that I've ever seen. There is no good reason to believe that there was any anti-Semitic intent behind Donald Trump re-Tweeting this picture. This six-pointed star is just a sticker that the text is slapped onto. This hare-brained theory picked up steam because the image was allegedly posted on a Neo-Nazi message board, but so what? This doesn't make Trump a neo-Nazi or sympathetic to Nazism is any way, because it's very likely that he simply saw the image on his Twitter feed and re-Tweeted it because he agreed with its characterization of Hillary Clinton as corrupt. And what kind of a limp-dicked Neo-Nazi would take such an incredibly subtle approach, anyway? I've got news for you people: Neo-Nazis generally aren't subtle like that! These are people that get swastikas tattooed onto their bodies; do you really think a Neo-Nazi would offer to the world such a lukewarm piece of anti-Semitic propaganda? Even if this was meant to be anti-Semitic by its original creator, the corruption characterization can be separated from the anti-Semitism. If a Neo-Nazi happens to agree with somebody on a specific belief unrelated to their Nazism, the other person is not somehow polluted by their Nazism. If a Neo-Nazi and I agreed that 2+2=4, this doesn't call into question my views towards Jewish people. To make such a leap would be incredibly illogical. When I first saw this image, it was the thumbnail of a Democracy Now! video. Do you know what I thought when I saw it? "Oh, they must be bashing Hillary in that video for her corruption. How swell!" Perhaps my mind isn't as finely-tuned to sniff out every potentially racist statement or image as some of yours might be, but as Sigmund Freud once allegedly said, "sometimes, a cigar is just a cigar." Let me also add that if you genuinely are concerned about anti-Semitism and racism, time spent focusing upon this non-example and others like it is time not spent focusing upon real examples of anti-Semitism. The final thing I'll point out is that this image illustrates to me one of the main functions of the mainstream media: to divert people's attention from the important issues onto trivialities. The conversation has been deflected from the more important one—"Is Hillary Clinton corrupt? ", "How do we know? ", "Corrupted by who? "—to the incredibly trivial issue of—"Is that six-pointed star meant to convey a subtle anti-Semitic message?"